I was happy to stay there. I defenely will return again. the only thing I dint like was no tv in the dinning room. plus I never got credit for the money I paid first before I got there. I supposed to pay only 120.00or so and not 146.00 or so. other than that it was a great place to stay.. It's at an amazing location. Super easy to get around. It's a very casual place for a cheap price. However, it's hard to sleep with different roommates. Some sleep early, some come back really late. If you're getting a room with 8 roommates, it's better if you can fall asleep super easy or else it's hard to get through the night. Its good place to stay, not the best for what you pay. 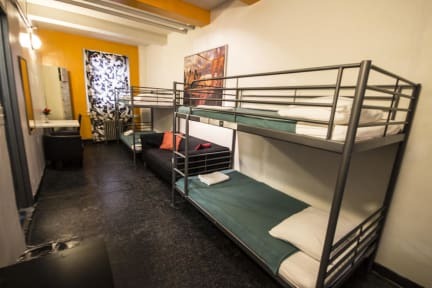 I would say, the best thing about the hostel is the location, not in the center of everything, but very well connected by metro. You are just a few stops away from the American Museum of Natural History, Columbus Circle, etc, and it's not a bad area, I felt safe. Other than that, it is not the cleanest hostel I've been to, we had problems with clogged shower drains on my floor, with the water being extremely hot or cold... so be aware of that as well. Good location and very friendly staff! Not the cleanest hostel I’ve stayed at though and more of a ”party” atmosphere so depends on what you’re looking for. Small rooms. This hostel lacks one really fundamental thing: a sofa! A common area with only tables and chairs is simply not good enough. Also, a funtional kitchen for preparing your own breakfast would be nice... Likewise, not being able to wash some clothes yourself, is a bit weird in a hostel... Otherwise, met some great new friends there! 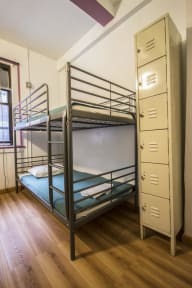 Worst hostel I ever stayed at! Only one toilet for the whole floor, no elevators, the shower water was boiling and you couldn't regulate the temperature. Small rooms, with just one spot to connect your devices to electricity and charge the batteries. Nowhere to cook a meal, just one big fridge. Internet does not work on the whole building, especially on the 5th floor and they have no elevator to get on the 5th floor, that is really bad. Also the place is not clean, the bathroons are nasty. Staff at front desk are liars. Awful place. Would never go back; telling others.